Grab a box of scrap paper, some knick-knacks, and pipecleaners, and create this Leprechaun stick puppet or use him as a magical bookmark for Saint Patrick Day. He's made of mostly recycled items. So, pull out the scrap box and Enjoy! This silly leprechaun is all scrap. 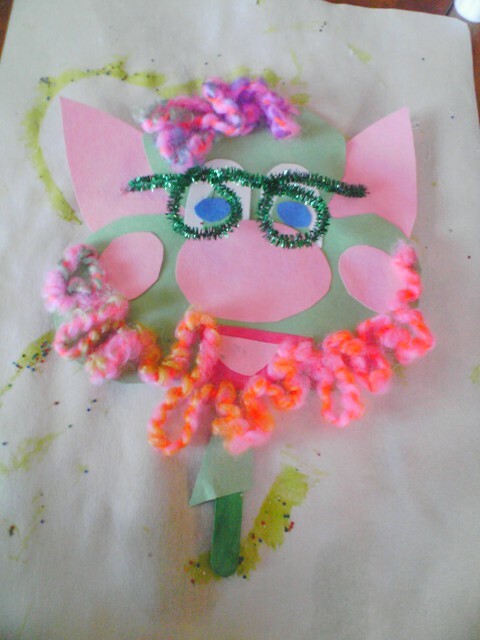 Just add a stick to make a fun puppet or go big and make a mask to hold over your face during a St. Patrick's Day Parade around the hallways of Preschool. After the parade, he serves double duty as a bookmark for your favorite leprechaun story. Plan ahead by cutting the scraps into triangles, circles, half-moons, trapezoids, and shamrocks for a quick Shape Lesson for preschoolers. Help! I have crafts for this week's scavenger hunt and can't figure out how to post them on your board. Send me your pinterest name and I will add you to the board. thehollyjollyone@yahoo.com or comment on the Purple pin on the board. You have to have a Pinterest account but it is an easy set-up.